Order up to 4 currencies online. Collect and pay at your local No.1 Currency. 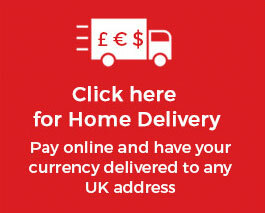 Search for the town or postcode to find your nearest currency exchange to collect your order. Tick if you wish to receive a text confirmation when your order is ready for collection. We will notify you once your order is ready for collection. You have two working days from receipt of notification to complete your order and guarantee this rate.